9 Bedrooms overall. 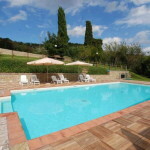 Valdambra Tuscany large villa which has been subdivided into 5 independent apartments with pool house, dependance, swimming pool and land. 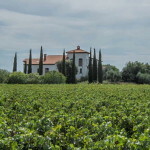 The property is made up of a villa, a pool house and a dependance. The villa is laid out on two levels and includes five independent apartments, composed as follows. The apartment n° 1 is composed of living room, kitchen, bedroom, studio and bathroom. It was completely renewed in 2015. The apartment n° 2, the main apartment, is laid out on two levels, connected by a lift. It is made up of a kids bedroom, bathroom, living room, master bedroom, bathroom and walk-in closet + dining room, completely furnished main kitchen, hall, laundry room, big former stable (there is a long table where everybody can eat together), two terraces (one closed with windows), guest bathroom. It was renewed between 2014 and 2015 and it has very high quality furniture. The apartment n° 3 is made up of a soppalco with bedroom and walk-in closet, kitchen, living room and bathroom. It was renewed between 2014 and 2015. 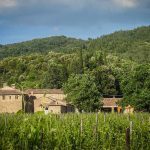 The apartment n° 4, in typical Tuscan style, includes a master bedroom, a walk-in closet, a bathroom, a single bedroom, a bedroom, a bathroom, a living room, a kitchen with access to the garden and the pool. The apartment n° 5, also in typical Tuscan style, is made up of a bedroom, bathroom, living room and kitchen. The pool house (46 sqm), a former barn, includes a hammam and a bathroom on the first floor, while on the first floor there is a play room/TV room. It was renewed in 2014. The housekeepers’ dependance (18 sqm) is an independent small house with a single bedroom, a bathroom, and a small kitchen. 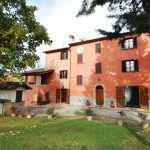 The villa dates back to the 16th century and it was completely restored in 2014, by using high-quality materials and with attention to details. The villa, a stone building, features exposed stone, parquet flooring, terracotta flooring, ceilings with wooden beams and terracotta tiles. It is served by a lift. 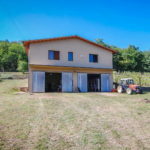 The property is surrounded by 2 hectares (or 4.94 acres) of land and has a parking area for three cars, terraces, a loggia, an outside oven and a BBQ. The beautiful swimming pool of approx. 100 sqm was renewed in 2014. 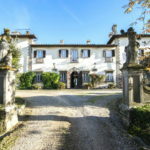 This Valdambra Tuscany large villa property includes a main villa, which is made up of multiple living units, in addition to two dependances and therefore it can be used both as a private home and as tourist accommodation. 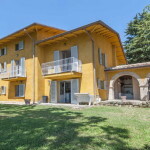 It is the ideal solution for those who are looking for a luxury villa surrounded by greenery, but within easy reach of important towns like Siena, Arezzo and Florence. 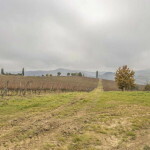 The property is in a privileged location, since it is located between Arezzo and Siena, within easy reach of the Chianti and stunning villages and towns such as Castelnuovo Berardenga (15km), Rapolano Terme (18km), Lucignano (34km), Cortona (59km), Firenze (70km) and San Gimignano (72km). Firenze Peretola airport and Perugia Sant’Egidio airport can be reached in approx. one hour, while Roma Ciampino airport and Roma Fiumicino airport are almost two hours and a half away.